For the last two months I’ve been happily listening to music while I’m running. And finally, now you can too. It wasn’t that I couldn’t listen to music before that point. Certainly I had plenty of devices that supported music while running, including Garmin ones. But at the end of the day I’m a huge Spotify user, and as such – that’s what I’m gonna leverage for music. Being 2018, I’m well beyond the days of loading individual music files to my watch. And the other two streaming platforms on Garmin just weren’t my cup of tea. 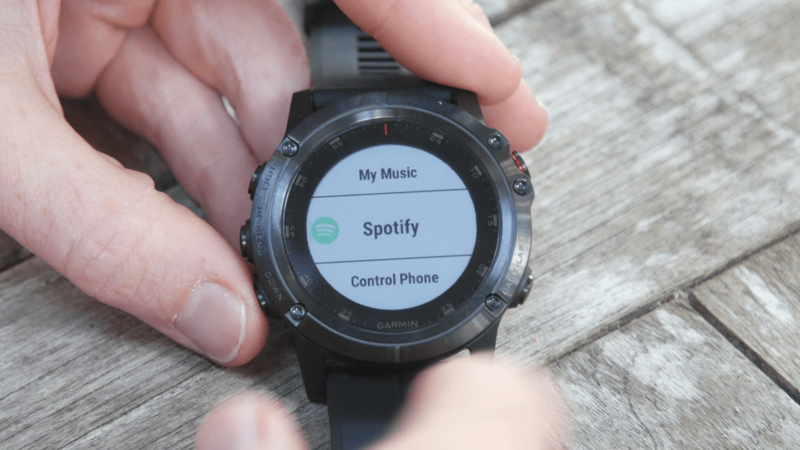 But as of today, now you can stream Spotify music to your Garmin watch. Assuming you’ve got a Garmin watch that supports music that is. As of today, October 3rd at 5PM US Eastern Time, that happens to be the Fenix 5 Plus series [Update Oct 30th: Now the FR645 Music also supports Spotify]. Of course, Garmin also makes the Forerunner 645 Music and Vivoactive 3 Music devices. Neither of those watches support Spotify as of 5PM today. But more on that in a moment. If you want to just get cookin’, you’ll simply download the Garmin Connect IQ Spotify app (using the mobile app or computer), authorize Spotify via your phone, and then you’re off to download your Spotify music from within the app. In case you’re looking for a bit more detail – I’ll dive through all that below. Note that Spotify requires a Spotify Premium account in order to make this all work. I’d note that this is without question the cleanest and best Connect IQ app I’ve seen Garmin put together (or anyone else). It just works. Seriously, it just works. Every stinkin’ time. And does exactly what I want it to do. Anyway, onto the details. I’ll first preface this section by noting that this these photos probably make it more complex than it really is. Basically, you just download the app from the Connect IQ store and then follow the prompts to authorize your account. That’s it. But, for the sake of making things super clear and non-short, here goes. First up is pulling up the Garmin Connect IQ app store for your device, be it on your mobile phone or the Garmin Connect site (if on desktop), then searching for Spotify. Also note – you’ll eventually need WiFi access setup on your device to make this work. As with virtually all wearables, it can’t be something like a Starbucks hotspot or hotel wifi. Once that’s done you’ll click to add it to your device, and in a short bit it’ll sync to your watch, which you can then confirm there. At this point you can go ahead and access it on your watch by scrolling up to the Music menu (it should show up by default there, but if it doesn’t for some reason you can go into the Widget Settings on your watch and add it to the widget roll). Once you open the Spotify app it’ll tell you to check your phone. You need to do this to authenticate and authorize on Spotify. And then you’re done with setup. So for the most part using the Spotify ‘app’ is pretty similar to using other Garmin music apps, except for whatever reason the entire experience seems cleaner, smoother and less likely to crap itself. I don’t know why, but it’s been rock-solid for me since August. Love it. You’ll notice you do get playlist covers, and single album covers, but you don’t get album/song covers for individual songs within a playlist. Hopefully that’s something that Garmin & Spotify can tweak down the road. There’s actually a nifty secret in here in that if you use Spotify to manage your podcasts, then you effectively get WiFi updating of podcasts (versus manual/cabled updating with the regular Garmin software). In general it’s quick, but not laptop-speed quick. For example, a 60-80 song playlist seems to take about 5-8 minutes for the initial download. Hardly a big deal of course, but not instant either. Simple math I find is about 1 minute per 10 songs. I haven’t found a limit to the number of songs yet you can download. On one of my Fenix 5 Plus units I’ve synced well over 1,500 songs across different playlists. And now you’re ready to play music. It’s no different than before in that it’ll go off and find your Bluetooth headphones first. And then you’ll use the usual controls to play/pause/skip/etc, as well as increase/decrease volume. All of the play-specific features are available within workout mode as well if you simply add the Music screen to your activity type. Interestingly, Garmin is also rolling out the new style player to the Forerunner 645 Music today in a firmware update. Thus another clue as to when that unit might see additional music app support. And thus you’re good to go! I’ve been running pretty regularly with Spotify and my Fenix 5+ without issue. For the most part I’ve been using these Skullcandy headphones, which work pretty well with my Fenix 5+ (I can contort my body into certain positions however where they briefly drop connectivity – but that’s rare while running). They were ones that Garmin had recommended and were in attendee bags for the Connect IQ Summit back in April. The Girl has also been using them with good success too. I’ve also got an older pair of the Beats headphones too, and they also work just fine. Ultimately though, none of that really matters though from a Spotify standpoint. As long as the Garmin pairs to it as a valid Bluetooth audio device, then Spotify is happy to play through to it. There’s no question this is a big deal. Since the Forerunner 645 was first announced way back in January at CES, the unavoidable follow-up question was always ‘When’s Spotify coming?’. The answer to that wasn’t in Garmin’s hands, but rather, Spotify’s. That’s generally the way music streaming services work – the streaming service holds the reins there. A company like Garmin (or Fitbit or Samsung or whomever) can request access and petition hard – but ultimately, it’s Spotify’s decision. When I met with Spotify back in April at the Connect IQ Summit, it wasn’t clear they were still trying to figure out where Garmin fit into their world. Certainly, Garmin now commands a significant chunk of the smartwatch realm. Especially once you remove Apple from the equation, because it’s unlikely we’d see an Apple Watch app for Spotify, given the competitive aspects there (vs Apple Music). 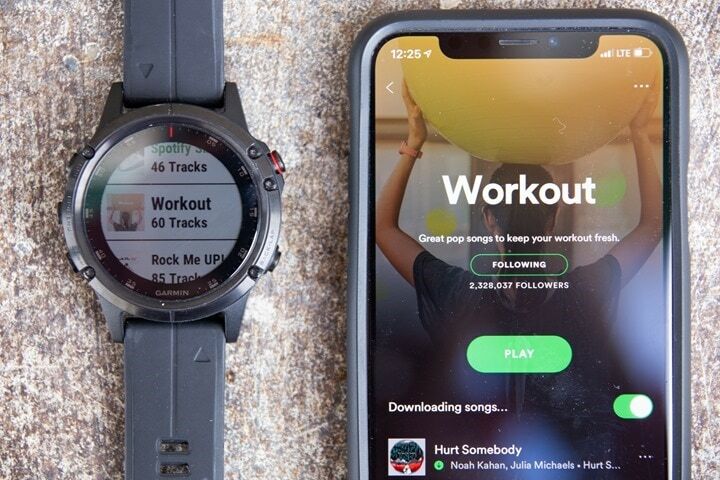 That basically just leaves Garmin and Fitbit as the most likely candidates for wearables that Spotify would partner with (beyond some existing Samsung units that have it). – For any app/device/etc that plays Spotify content, Spotify must individually certify each such ‘system’ (model). Be it a speaker, a watch, or anything else. 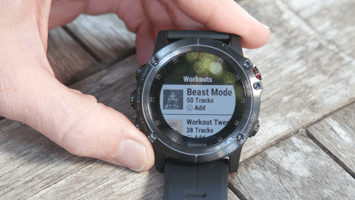 – Garmin overwhelmingly wants all of their music devices to have equivalent music capabilities as fast as possible. Got it? Good. I suspect you’ll be able to figure out that this isn’t a case of Garmin purposefully only releasing the Fenix 5 Plus variant because it’s their higher end watch over the other two. Hopefully, we’ll see them branch out beyond this watch with other units faster than you can keep hitting that refresh button on your browser. 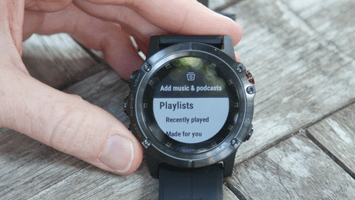 In the meantime – for those Fenix 5 Plus users, go forth and enjoy your newfound music capabilities. Any chance this will get rolled out to the 935? Really hoping Google music are watching (listening!?). Nail in the coffin for Mighty too? That might be a wee bit difficult, given the issues with transmission underwater. You’d essentially have to cache the music on the headphones too. I suspect the main issue though is that the market for a swimming-specific accessory like that is limited. I think we’ve seen larger companies struggle with demand for swim-specific hardware, mainly because more competitive swimmers tend to hate having additional hardware on them. How would you expect that headphone to connect to the Garmin watch? Bluetooth only has a range of an inch or two under water. And without a headphone jack, there is no other way to connect headphones to Garmin watches. Even if you keep your head above the water, every time your hand enters the water the headphones will lose connection with the watch. I think something offered by WaterFi is what would fit your requirements best. You may not have gigs of mp3s like I do (all legal, I swear. Really), but if you really need music, I swim with the Finis Duo and it works ok. It’s not the same as listening in the ears, but it does pretty well and is certainly better than swimming with nothing. Have a look at the Bragi Dash Pro wireless earbuds. Mine work with the 5X Plus and I use them while swimming – training in the pool. Thanks for the shout out Paul! The Delphin will also work with most music apps, not just Spotify. Apple Music, Pandora, Amazon Music, SoundCloud, Audible, Podcast and Radio Addict, etc. all work. You can use either wired or Bluetooth headphones, although Bluetooth headphones need to be very close to the Delphin for use underwater. The Delphin also counts laps and gives real-time lap counts and splits through audio feedback at the frequency you choose. Since you can stream music, you can also use an app like Zello as a coach communicator to talk to your swimmer in real time using your phone. I’m happy to answer any other questions that pop up! I use JBL ENDURANCE DIVE, Built-in MP3 Player, designed for swimming. Take a look, you will not regret. Do you think this will make it’s way into the Descent? 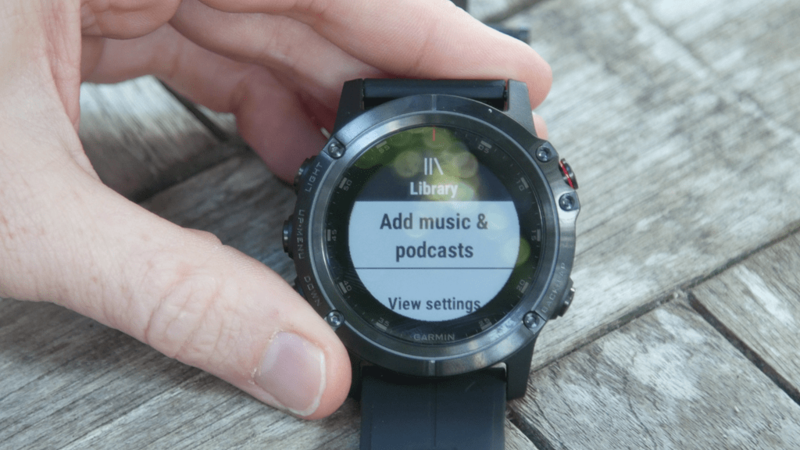 No, the Descent doesn’t have music capabilities (it’s based on the original Fenix 5X, not the Plus series). Is Apple music also supported? Oh man, I hope this doesn’t take too long to come to the rest of the music watches. I’m using the 3 month free trial of Deezer on my Vivoactive 3 Music at the moment and it works well but I would really prefer to stay with Spotify. That’d definitely be a Google Music driven decision. I don’t believe they’ve done any integrations outside of the Google platform (akin to Apple Music). Google Music IS available on IOS so I would imagine Google would want to support Garmin as well if they thought the investment in the app was worth it. Sorry, I was talking 3rd party integrations (i.e. integrating it on a watch beyond Android Wear). Is there support on Samsung’s wearables for it? Google Music actually works fine on Sonos players, which I would consider totally unrelated to Google, so that seems like a good sign. When using the fenix 5 + series and connected headphones, have you noticed any connection issues? i.e when the watch is on the left wrist and the headphone receiver is on the right of the ear, I’ve heard that it can drop out sometimes? Depends 100% on the headphones. With the Skullcandy ones for example I’m good running (with watch on either wrist). However, if I stop walking and put my hands down to my side and then turn my head (like to stretch my neck), I get dropouts – it’s just that little bit extra that kills it. But normal running/walking – totally fine. In my experience with my older Beats and others it varies a bit as well. It’s always kinda this careful balance by both headphone and wearable companies right on the edge of battery/performance limits. No issues for me with a Plantronics BBFit with watch on left wrist, which is opposite to “optimal”. Much better connection than to the Apple Watch Series 2 that preceded the Fenix 5+. Much better battery life too, on par with Garmin’s advertised specs. I was very annoyed to discover that my relatively fancy Bose headphones have terrible connection to my phone when my phone is in my right pocket (as it usually is). Have to swap phone to other pocket when walking with my headphones – invariably means I am scrabbling for my phone in the wrong pocket whenever I get to a set of Underground barriers! After discovering that my Bose SoundSport Free wireless headphones would not hold a connection with my Fenix 5S Plus, I tried numerous other true wireless headphones. The only ones that I’ve found to work well are the Sony WF-SP700N headphones. I believe they work because they have a receiver in both ears (importantly in the left ear closest to my left wrist where I wear my watch). I use the AfterShokz Trekz Air headphones – no dropouts for me, and they are open ear headphones so you can also hear your surroundings, which should address some of the concerns noted from the Girl in the most recent DCR newsletter. Ryan, could you please tell the firmware version number and the build date of your SoundSport Wireless free? I had to return mine and got a new pair which work – at least – work on an AW3LTE without dropouts. How’s the battery life say you run 1hr every day? Ray, you say you don’t think that we will see Spotify on Apple Watch because it is competitive with Apple Music. I don’t think that is the case. WatchOS 5 has a new audio background mode that would allow anyone to include their streaming service on the Watch. There was even a session at WWDC on that. It even hooks into their workout app. If Apple wanted to prevent competition they would not have added this framework, although I suppose they could still reject the app – I think we might hear about that though. Spotify is already on the phone, so I think the ball is in Spotify’s court. That being said, Spotify is still not on AppleTV, although, again, I think that is on Spotify. It’s true, that does open the door more – no doubt. Whether or not Spotify leverages that door, and whether or not Apple restricts them in other ways that make the platform nonviable remains to be seen. I think that’s always the hidden aspect of any development effort, is there some gotchya in the way Apple constructed it that Spotify can’t get around (or Apple won’t change), or is Apple truly open to it. Obviously, Spotify on Apple Watch would be big for Spotify (and also a big hit against Apple Music too). Yeah I agree with you Mike – I don’t see Apple rejecting a spotify app for their watch. That indeed makes no sense at all, what Ray is saying. Otherwise why would they support Waze and Google Maps on CarPlay? We’ll see. I’d be happy for Spotify to come to Apple Watch, but ultimately there’s nothing logical about the music industry. Things like CarPlay are in entirely different groups which have different priorities. You mean I might actually be able to ditch the Mighty? No difference on battery life than other Garmin music sources. It varies slightly by model of course. No, it lacks the music capabilities. I am surprised to see people this is a big deal. Honestly, I just don’t get it and that is ok because we are all different. But this day and age I am not running without my phone, wife, kids, etc. Its not that I want to be in contact, its just that extra bit of safety for me and to stay in contact in case of emergency. Plus, if I happen to get hurt (44 yrs old, so I could break a hip), a phone is all to convenient. So, if I have my phone that is what I would rather use for music anyways. Rather than spotfiy, I would rather have them fill up the damn screen on the 935 and eliminate that god awful large black bezel. I’m in the same camp myself, in my book music is useless unless it comes with LTE as otherwise I may just as well carry my phone and then the music can be controlled from the watch anyway. Just recently got a smartwatch with LTE to wear on other wrist, so now I don’t even have to bother with offline downloads. Just stream on the go. Calls work great too. Even when I don’t listen to music I can answer a call on the built in speaker of the watch. Hopefully some day I can have all this on one device from Garmin. During more demanding runs I bring the phone but like tovstay more focus and don’t want music. eSim is a must on next Garmin devices. Cellular is more complex, and its usage is tricky. Cellular service burns battery like nobody’s business – so that’d be a shift for Garmin, which usually focuses on devices that last 5-14 days on a charge. Obviously, not saying they won’t do it, but there will be compromises. The other challenge is that it’d be unlikely that Garmin would want to do live streaming of music over cellular during a workout, since that’s really just doubling down on the power consumption challenges. Ultimately, there’s a crapton of people that don’t want to carry their phone on a run, or even at the gym. When I’m at the gym my phone is off to the side, and not something I prefer to carry with me from station/set/whatever to another. I didn’t think about the gym, I could see that as useful. If you are lifting weights a phone gets in the way. I am not sure I would even want lte. I preference battery life . Do ypu have to do anything to already downloaded playlist to “refresh” the DRM? I guess that’s a justified reasoning. Some people might burn their battery in a matter of hours and then complain about it. But in the end, doesn’t battery life always vary by use on a device? Does that mean the feature set should be more limited if it’s technically possible? As for me, I don’t even always listen to music. Standby doesn’t eat battery that much and if I stream music I can always charge the device after the run. I could do offline as well if I wanted to save battery, but that’s always extra work to do and less convenient. In the end, after having a few injuries and other accidents (once got attacked by a dog that had escaped its owner) I’d rather not go running without cellular anymore. But I do admit that at first I thought I wouldn’t need it either. 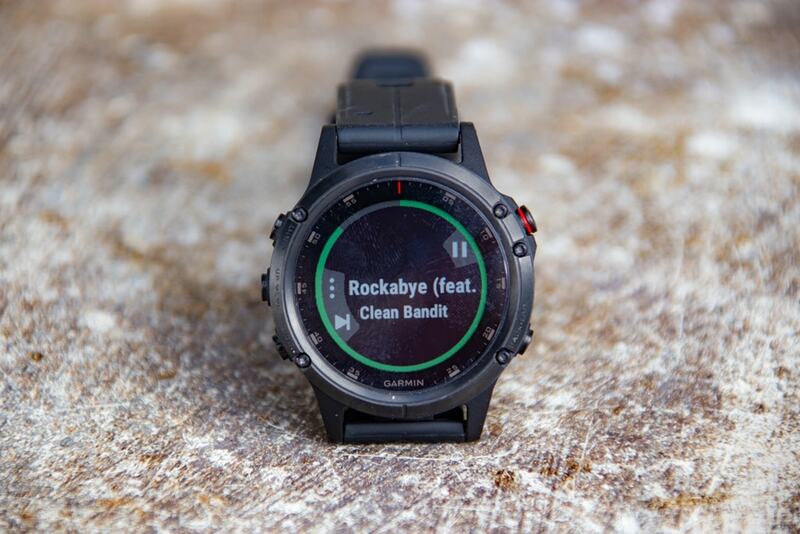 Any idea when/if this will be available for the Fenix 5 Sapphire Edition…? All Plus editions, but no non-Plus editions, as those don’t have any music support. Bummer, thanks for the info. This is indeed fantastic news. I’ve been getting by with trial versions of deezer and runcasts on my fenix 5 plus, but Spotify is such a better answer. No, not limited to that. I’ve got something like 1,500 Spotify songs downloaded before I gave up on downloading songs because I got bored of adding them. Is the Deezer 500 mb limit given by Deezer or Garmin? It is/was a Garmin limit. I believe it’s slowly being upped/removed. Otherwise it would be a competitive disadvantage for Deezer etc. So someone from Garmin should bring some clarification. It’s gone for Spotify – I couldn’t have downloaded 1,500 songs without it gone. I chatted with Garmin about it, and it sounds like it’ll be even for all players shortly. Hey DC “There’s no question this is a big deal. Since the Forerunner 645 was first announced way back in January at CES, the unavoidable follow-up question was always ‘When’s Spotify coming?’. The answer to that wasn’t in Garmin’s hands, but rather, Spotify’s. That’s generally the way music streaming services work – the streaming service holds the reigns there. ” I think you meant “reins”. Thanks for the review. It is still needed a wifi connection or the phone once a playlist is downloaded on the watch to listen to it???? No phone/connection needed once downloaded. Great news but any plans to have a new update for the 935 (which is an amazing watch) with Music capabilities? in additon, what’s the effect on battery usage while working with Music during workouts? how much can it last? having the 935 on my wrist 24/7 and using it for running (~100K/week) and charging it only for few mins everyday when taking a shower. I was recently looking into headphones that I can use for running and on my stationary bike. I saw you mention Skullfamily headphones that you used on this run. Looking at their website I couldn’t find any headphones for sport. Which ones are you using? While searching I came across AfterShokz Trekz Air (link to aftershokz.com). While quite pricey, I like the idea of hearing my surroundings when running. However, I’d like to know how well they work in real life before spending quite heavily on these. Have you, or anybody else here, ever tried either these AfterShokz or any other bone conduction headphones? Any hints/tips/experiences are much appreciated! Oops, never mind my question on the Skullcany earphones … missed the link in your article. Sorry! I have the Trekz Air – highly recommended. The work brilliantly with both my Fenix 5 plus (I have had no dropouts in a month of running, snowboarding, riding etc) and also with my phone. And the fact that you can hear traffic and other background noise makes them far safer for cycling. Thanks for sharing your experience Matt. Highly appreciated! I have a pair of AfterShokz. After a run I can stand there & carry on a conversation with someone while music is still playing & hear both the person & the music just fine. However, this is also the downside; because your ears aren’t blocked, I find situations with even moderate background noise overwhelm the AfterShokz & I can’t hear the music that I’m playing. For example, the music in the place where we get a post-run beer overwhelms my AfterShokz. It’s interesting to see these watches evolving but I just don’t like running outside with music. I need to hear what’s going on around me. When exercising in the gym I’ll have my phone with me which means this functionality isn’t needed. Good news and overview! Great to have Spotify. Question: Did Garmin (or Polar, Suunto, etc.) announce any future plans on integrating LTE capability into their watches? And another one: did any smartwatch vendor already consider to pack a camera in it? … when trail running (or in new places) it would always be handy to be able to take a picture when I don’t have my phone around. Great news! Now I just have to wait for the Fenix5+ to go on sale. I guess chances for that to happen this year (Black Friday, Christmas?) are essentially zero? Would Spotify also work on the D2 Delta-series? Shouldn’t it be “songs” instead of “seconds”? How about the sync between watch and phone? Would be great if they remember where the other device stopped. I do not want to start the playlist every time from the beginning. Hi, does someone know if all people on a Spotify family account can use their individual Garmin watches? To clarify: A family of two with a Spotify Family account. Both persons in the family have their own Garmin Fenix 5 Plus and both have a Spotify account belonging to the family account. Can both use their Spotify on their Garmin? Because Deezer on Garmin only allows the main account holder to use Deezer-Music on his/her Garmin. I gave up on Deezer for a similar reason (Apple CarPlay & Sonos speakers only worked with main Deezer account). Both CarPlay & Sonos work perfectly with Spotify family accounts using the account of the person listening. Yes, all family members can use it this way, as all family accounts are premium. Does the Spotify app support local files? I have some songs that are not available on Spotify that I was able to add to playlists on my computer and also on my phone using wifi sync. I have a Mighty but that doesn’t support local files so if this does it could push me to upgrade my watch sooner. The watch supports local files independent of the Spotify app. But I don’t think you can mix the two while listening… as in I don’t think you can shuffle between music providers (one being local files and the other being Spotify). Can you select download quality? I imagine that higher quality downloads have a bigger impact on battery life. If it only downloads at “normal” quality, that’s reason enough for me to stick with my Mighty. No, you can’t change the download quality. Ray, can we search for your playlists on Spotify? I don’t really have any custom playlists. I just tend to follow others. Is there any chance of other platforms following in Spotify’s wake. Specifically Amazon with Audible? I expect to see others. In many ways, Spotify was the elephant that Garmin put a lot of resources on getting out the door over the last 6 months or so. Thus, I think you’ll see that now that Spotify is mostly behind them* that you’ll see them turn heir attention to other streaming platforms again. *Obviously they have to release the FR645M and Vivoactive 3 Music apps, but I don’t see that as a major effort, and in some cases is more procedural than anything. I would be in heaven if Amazon would get behind this… I just can’t seem to like Deezer off this free trial. I like Deezer but would like to have Spotify mainly because everyone else is on Spotify – ie sharing playlists. I am very anxious to get Spotify AND Audible (or Google Books) on the 645M. I would even take Audible first and put up with Deezer for a while longer. Has anyone managed to put a book on their Garmin yet? How did you do it? How was the play back? Any chapter support? Resume? Just want to make sure I’m understanding this. Can I put my Spotify music on my Garmin plus and not have my phone with me but still listen to music? If so, will it work while I’m trail running with no wifi? Correct, no phone required while running. No WiFi required while running. Purely bring your watch – that’s it. Well, that and headphones. Couple of questions regarding Spotify’s podcast function. Do podcast download as a playlist or do you need to individually pick which episode to download from the watch? When you finish listening to a podcast episode, do you need to manually delete it (“edit downloads” button) or would it auto delete when you click on the “update downloads” button? 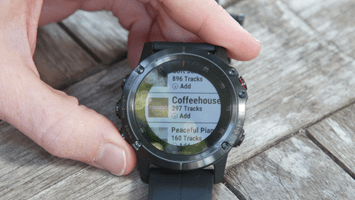 Also, do you know if these music-enabled Garmin watches support variable speed playback? Is that something that could possibly be supported for podcast or audiobook playback? Unclear if there is any hardware or software limitation that may not allow it. So basically your left to managing everything manually on a watch…guess I’ll keep my phone with me for a while. You subscribe to a podcast, all new episodes are made available (aka downloaded), once you’ve listened to an episode it is removed and if a new episode is published it gets added automatically. Wish Garmin/Spotify get this done some time (or it is there and I am simply too stupid to see it). i can´t unistall it how do you do that?!? and now it seem i have no acces to previously downloaded music?!? At last I was able to uninstall Spotify as usual through iq Connect app but still don´t know how to acces previously downloaded music since the menú goes directly to spotify…. Have you tried going to source and selecting My Music instead of Spotify to access previously downloaded music? Thats how I switch between Deezer and My Music on my 645M. Also re uninstalling the app… you should be able to do it via the Garmin app on your phone – same place you went to install it? Thanks for your reply Dennis, I have tried already but nothing now I am train through Garmin Express, it says the music is there so I have deleted and uninstalled everything and try again. Well tried again through Garmin express buy nothing, the music is in the watch or so it says Garmin express but when I access to the music through the DOWN button or LIGHT button I can only access to Spotify music the only options I see is 1library 2 volume 3 Back track 4 Random but no sight of the gear icon to choose the music source. Someone else with this problem? Mike, goto Settings > Music > Music Providers, from there you can change how you get your tunes. Yes!!! Thanks a lot Lee that “worked” now it changed the music source, the watch is not able to display the music (maybe too many songs? 6gb) but a least it changed. Has the Fenix 5 plus become now your go to running watch? Or is it still the 935? Yeah, at this point with Spotify it’s what I prefer. This pretty much sealed the deal this summer for me. To me, this is exciting news. I understand that there are those people who don’t like to run with music and whatnot, but I am one who feels like listening to music enhances the running experience, especially on long runs. And I am a running minimalist who doesn’t like carrying keys, a wallet, or a phone while running. That being said, I just read The Girl’s newsletter today, and she has a very good point about not listening to music while running for safety reasons. There are plenty of stories about women being attacked while running, especially while running in the evening with earbuds in. That’s a very dangerous scenario, even for men, so I do think you need to be careful and constantly aware of your surroundings. Still, this is a great feature to have on the watch while you’re doing an indoor run, doing spin or working out. And the controls are stupid simple like Ray said. Even before this announcement, I was able to use my Fenix 5 Plus as a remote while streaming Spotify in my car or at home which I think is pretty cool. I imagine you can do the same thing with Pandora or any music streaming service. I was hopeful that Spotify would come to Garmin at some point and super thrilled that it happened sooner than later. I’m even more thrilled that we didn’t have to wait until the Fenix 6 or some new watch comes out to have access to our Spotify account. Might be worth mentioning that this does NOT appear to be available yet for APAC models. Basically people living in the Asia-Pacific are treated like second-class citizens that get everything months after the rest of the world. Sigh. Also – I’ve had multiple Skullcandy Method headhpones go kaput after connecting with my Garmin Fenix 5 Plus. Several other people on Amazon reviews and on the Garmin forums have noted the same. Skullcandy support is no help – ‘you must have put the headset into programming mode’ etc etc. It’s unfortunate because otherwise I love the Skullcandy earbuds, but when I run without my phone and just my Fenix, I use different wireless headsets. Pretty obvious that if you don’t know….it’s not APAC since Garmin Express clearly shows APAC right in the main window when you connect your watch, and in any event you wouldn’t be able to update to 5.10 otherwise. 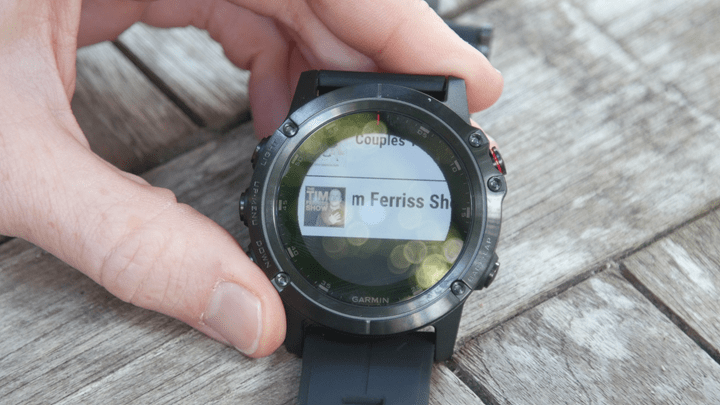 What BT codecs does the Fenix 5 Plus family support? AptX? AAC? Vanilla BT codec? Thanks. Not when asking in Dutch. Duh! Do you think Polar Advantage series will have this feature? And a Watch paying system? My V800 broke and i was wondering to get a Garmin after seeing this post. I don’t believe the Vantage has anywhere near the storage space on it to do so. 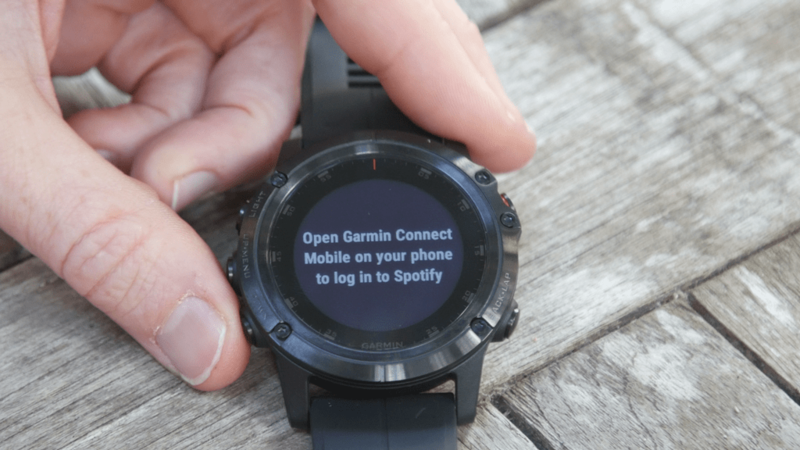 And honestly, even if it did – it would still have to convince Spotify to allow them to integrate, which it’s highly unlikely Spotify would do given how much work it took for Garmin to convince them (and Garmin’s sales numbers dwarf Polar’s). Are you thinking weeks or months for the 645M? I don’t think it’ll be months. Sorry, I meant the fenix 5S plus..
Nope, the 5S Plus will work just fine! i live in Indonesia, and i unable to find Spotify app in the IQ Store (but available in US IQ Store). 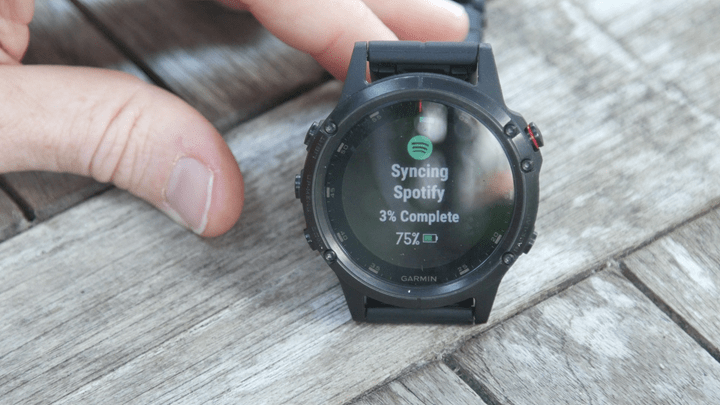 Anyhow i could download the spotify app to my fenix 5x plus? You need firmware version 5.10 to be able to download the Spotify app from the IQ store – but 5.10 has not been rolled out for APAC yet – in fact, APAC hasn’t even gotten the 4.74 update, we’re still stuck on 4.20. I’d imagine it will be at least a couple more weeks before APAC gets Spotify. Can You update info about music listening capabilities at model comparison calculator aswell? Does Spotify scrobbling of listened songs get updated to Last.fm? I think you’ll see it pretty soon. I just went to Connect IQ and couldn’t find the Spotify App for my FR 645 Music. I live in Mexico. Is it only available in tbenUS? It hasn’t been released yet for the FR645. 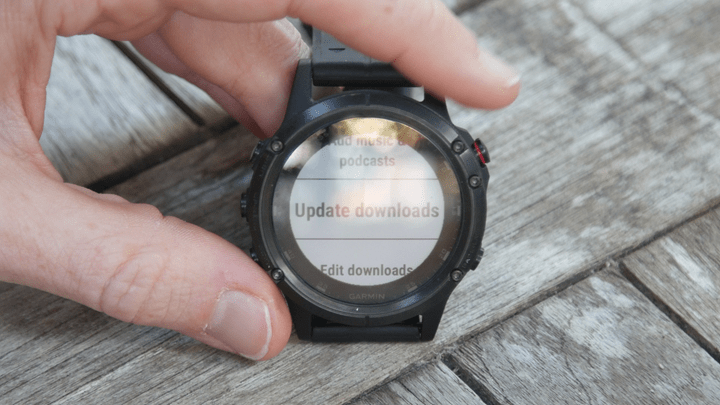 I have a fenix 5+ but it does allow me to download, stating my device is not compatible. Double check that your devices firmware is fully updated. It should be at 5.00 or higher (ideally 5.10). It’s updated. It could be region locked? Odd – I’m told there’s no region lock. Technically there’s also a Bluetooth update you need, but it’d be really difficult to get to 5.00 or 5.10 without it. If you have a desktop/laptop, the easiest way to absolutely confirm is using Garmin Express or the trusty Garmin Webupdater with the USB cable, to make sure it’s fully up to date, specifically the extra Bluetooth firmware bits (since that’s technically separate). Thanks for taking the time to reply. My bad, the software on my device is 4.2. And unfortunately thats the latest for my region. 5.0 and 5.10 are both not available to donwload yet. Ive tried via usb and bluetooth. Is there anyway i can force update or download from another region ? As noted several times above – and as shown in your screen shot – you have an APAC model. The later firmware updates from Garmin are not compatible with APAC models, forcing an update is almost certainly A Bad Idea. Why APAC models are stuck on a different update schedule versus the rest of the world, and way it takes weeks or months for APAC to get the latest updates, is a question for Garmin (maybe something to do with double-byte character needs?) but in any event – you’re advised to wait. They just removed all references to Spotify. 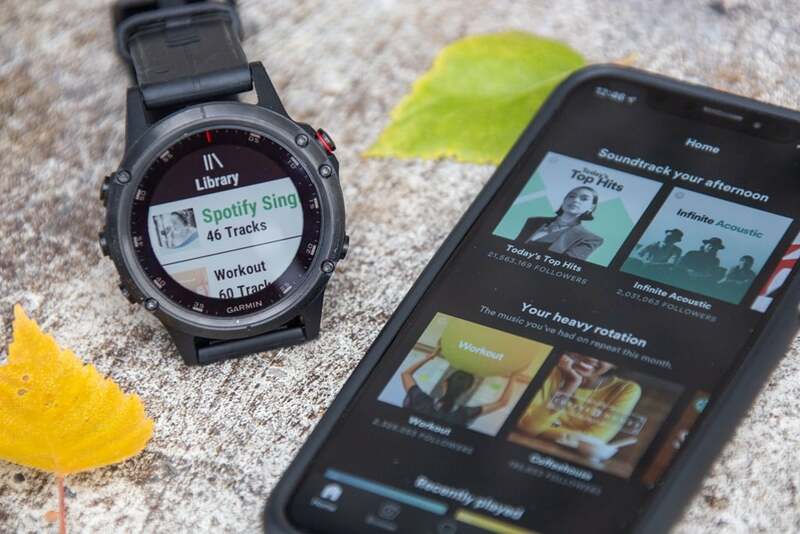 It looks like the APAC version isn’t going to be getting Spotify for a while…..
Hi, is it possible to download spotify playlists to the watch without having to stream – so I could run and listen my choice of music without having to carry my phone with me? Yes, that’s the main use-case of the Spotify-integration. Why no double tap or long press within activity to change the song?? The three click process to change a song is terrible. I have one data screen while racing but I like to change song depending on temp and such…. That’s actually a cool idea for a hotkey. My bet is if you suggested it to Garmin they’d probably implement it. how does one do that? is their a proper channel? There are two main avenues. 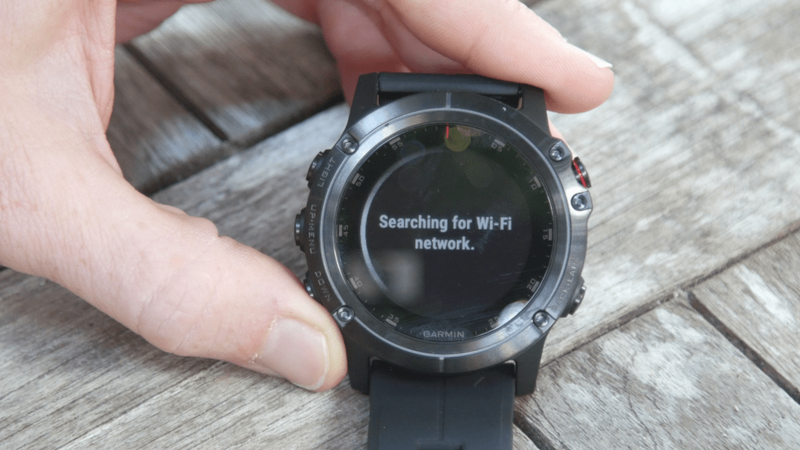 And the second is to the Fenix team specifically, which is to e-mail fenix5.beta@garmin.com – that’s also concurrently used for bug reporting, but I’ve been told that well thought out (but not overly wordy) suggestions are considered through, and it tends to get directly to the team in question and is read by the right lead people at the team. I think the ability to assign a hot-key to the skip function would be a relatively low effort task with a potential big impact. Have you heard anything on the release date for Spotify on the 645M? I’m tired of checking the connect store everyday. :). Thank you! It is also available today for US. Installed already on my FR 645 Music. Well, finally got Spotify installed on this APAC model, and it works great. HOWEVER – it seems to really chew threw battery life. I’ve gone for 3+ hour events and only had my Fenix 5 Plus lose 5% or so of its battery charge. I’ve now done two runs with the Fenix 5 Plus using Spotify. On the first run, the battery went from 65% to 35% in about 45 minutes. This morning it went from 45% to critical battery save / shut down in 70 minutes. DC, have you noticed any abnormally fast battery usage using Spotify with your Fenix 5 Plus? I’ve noticed a much higher than normal battery drain on my 645M too actually, both when just sitting in my apt & during a run (compared to playing music I’d simply moved from my comp to the watch before we got the Spotify app, never ended up trying iHeartradio or Deezer. Wondering if it might have to do with how often it’s checking for playlist changes when connected to my home wifi, but that wouldn’t explain the extra battery drain when out for a run & listening to music.. Anyone else notice this? Don’t know about the 645M, but the really fast battery drain has been noted on the Garmin forums. The battery itself didn’t magically get worse, so it’s clearly a firmware issue, so (hopefully) will be fixed with an update at some point. As it is now, I can’t really use Spotify on a run etc. unless I’m fully charged and/or the workout is less than an hour. Now available for the Garmin 645 music. The battery life for the Fenix 5 Plus when listening to music normally is reasonable. I’ve done long runs (2 hours or so) and only lost 5-8% of battery life. You should get 6-7 hours without a problem, assuming you’re reasonably charged up. Battery life using Spotify on the Fenix 5 Plus is *horrendous*. You’ll lose 40% of battery life or more in an hour. 2-3 hours max, even if fully charged. The battery didn’t suddenly get worse (and only get worse with the Spotify app) so I am hoping this is something that can be fixed with a firmware update. As it is now, I avoid using the Spotify app for long runs. Are you sure on the 5-8% in 2hrs? That doesn’t seem right, that seems very high. That sounds like it’s pulling from a phone for music, and just using GPS. The watch specifications only say 6-8 hours for a full charged device for GPS+Music. Which is basically the same as any other music device on the market. Only just bought the Fenix 5 Plus and I’m super excited. Your videos are tremendous to get me started and navigate my way through the endless options. When trying to set up Spotify though, I keep getting a ‘your device needs to be updated via Garmin Express’. When I go there, I’m not really sure what I’m updating exactly or where to do this. Have you run into this and, if so, any tips? All three ways work, though can kinda serve different purposes. Generally speaking the Bluetooth/WiFi update manner is great when you don’t really care and an update just magically arrives some random day. However, when you want to immeditaely force an update, the computer USB cable is your best bet. A) Garmin Express: This is the main option, a desktop app for Mac/PC that has all the options/trimming, including adding apps and syncing music and stuff. It’s mostly what Garmin wants you to use. You can just search “Garmin Express” in Google, download it and follow the steps and your device gets updated. B) Garmin WebUpdater: However, back in the day (like a decade ago), Garmin previously made an app called Garmin WebUpdate. It’s singular purpose in life is updating Garmin devices. Fitness, Car, boat, train, plane, etc… Ok, not train – but all the rest. It’s super efficient and works 100% of the time. It’s what I tend to use for quick updates. In any event, I’d probably just use Garmin Express for the easiest option. Once updated, then the Spotify app will work. Also, while you’re at it, Garmin Express will ask you to configure your home WiFi. You should do that, since you’ll need it for Spotify anyways so it’ll save you some time. Sigh. I forgot there wasn’t support VA3m and bought it over Black Friday. Now I have to decide whether I should return it and get a 645m or wait it out. I’m in EXACTLY the same boat!! ..and now trying to decide if I have faith in garmin to get the VA3M on board, or return the watch. See DC’s reply #154 in this thread…contains a link to send a suggestion directly to Garmin. Let’s both push them on availability of Spotify on our VA3Ms!! Spotify on 645m is a massive game changer. Is this only for the M type models ie 645 Music vivoactive Music? Or also the regular 645 and vivoactive. Only the ‘M’ variants – for Music. The non-M variants don’t have the required storage space in them. I’ve never used Spotify, but I am presuming that I have to pay a subscription in order to get music onto my watch so that I can play it without having my phone with me? I am of course referring to music that I do not fully own (i.e NOT an MP3 etc). I don’t currently own much music and I am not sure I really want to pay a subscription either, so with this is in mind would you say the Vivoactive 3 music does not offer me anything over the non-music edition? The Vivoactive 3 Music does not have on board audio for alarms does it? I would prefer to have an audible beep when timers expire. Correct on Spotify. But Garmin supports other platforms too, like Deezer and iHeartRadio (also subscription). If you do have any owned music, then you can transfer that no problem without a subscription. I’d agree that if you don’t have any of those things, the non-music variant will suit just fine. Correct, it does not have audio beeps onboard. Any news on Spotify for VA3m? Nuttin’. I’m hoping though that with CES two weeks away we’ll maybe here something then. OK, but is Spotify for VA3m a matter of time or is it a risk that it will not be supported at all? Received the Vivoactive 3Music as a Christmas gift….anxiously awaiting update to include Spotify- not interested in another music subscription to iheartradio or stale playlists from my old collection of cds. If not released soon, I will have to return it. Spotify for VA3(M), “ASAP” PLEASE!!!! How does it compare to the Vivoactive 3 Music, have you used both heavily? I know the Fenix 5+ is a higher end model, but that’s about all I know in terns of differences. Can you “stream” Spotify, or do you have to download the entire playlist(s) first? I can stream Spotify with my Galaxy Watch 46mm LTE, as it always has a cellular connection. I have vivoactive 3. Have Spotify hooked up and use. However seems like every 3 days I am out of battery. Should I be log out of Spotify to save battery on my garmin watch? Or is this tropical. Seems like my Fitbit battery lasted longer. If you want to move playlist from spotify to deezer or vice versa then use MusConv.com tool which i personally tried. It’s a great tool. Is this workaround currently necessary or is Spotify support finally on the VM3? I’m curious about the battery concerns since my 645M barely lasts 24hrs WITHOUT an activity or playing music at this point. My battery seems to get worse the more songs I sync via Spotify. Planning to call Garmin about it, but was debating picking up VM3 as a backup if they need me to send the 645M back for a replacement or repair or something.